In the early ’90s, id Software worked on a series of side-scrolling platformer games known as Commander Keen. The studio is now more largely known for the likes of Doom, Rage, and Wolfenstein. Now roughly three decades later, Commander Keen has returned with a surprise re-release on Switch. 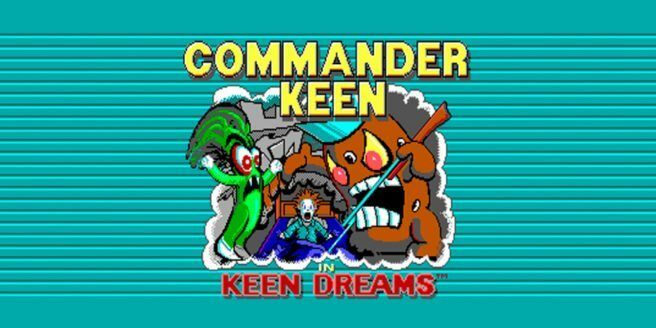 Commander Keen in Keen Dreams is available on the eShop despite no prior announcement. Commander Keen — defender of Earth! In his ship, the Bean-with-Bacon Megarocket, Keen dispenses galactic justice with an iron hand! We find young Billy discussing matters of paramount importance with his mother. “I bet Neil Armstrong never travelled to Vorticon VI and defeated the Grand Intellect, either,” Billy mumbled at his plate. He sat there, legs dangling, staring at his offensive, starch-laden foe. After a pointed remark about the quality of the mashed potatoes, Billy was sent to his room. “Stupid vegetables,” he grumbled, his eyelids growing heavy. Suddenly he woke up, and his bed was atop a hill. On either side of his bed were giant potatoes wearing metal helmets and carrying bayonets. “Come with us now, Captain Keen,” said the first. “You’ve been brought here by the Dream Machine,” said the second. Billy frowned, grabbed his football helmet off his bedpost, and started to put it on. “We’re Tater Troopers, it’s plain to see,” said the first. “How about a walk on the fried side boys?” Keen said. “Aw, nuts. My Hyperpistol’s empty,” he said. “Keen, oh, Keen, oh, Captain Keen! Save us from the Dream Machine!” he said. “That’s Commander Keen!” the young genius corrected. “Whatever. Save us!” said the child. So Billy hopped out of bed and started on his quest to defeat King Boobus Tuber and destroy the Dream Machine! Commander Keen in Keen Dreams costs $9.99 on the Switch eShop. Lone Wolf Technology has handled publishing.